So far, this year has seen three UK indie bands releasing a Christmas 45: of course Glasgow's Bis, one of the three Snowflakes singles, and also London three piece Girl Ray and Durham quartet Martha: although the single of this last band is more a winter-themed single than a Christmas single. Girl Ray was one of the band's on Snowflakes shortlist for this year's Christmas single, as I loved the band's debut 45 'Trouble', that was released in November 2016. At the time the single was released, the three members of Girl Ray were only 18 years old. 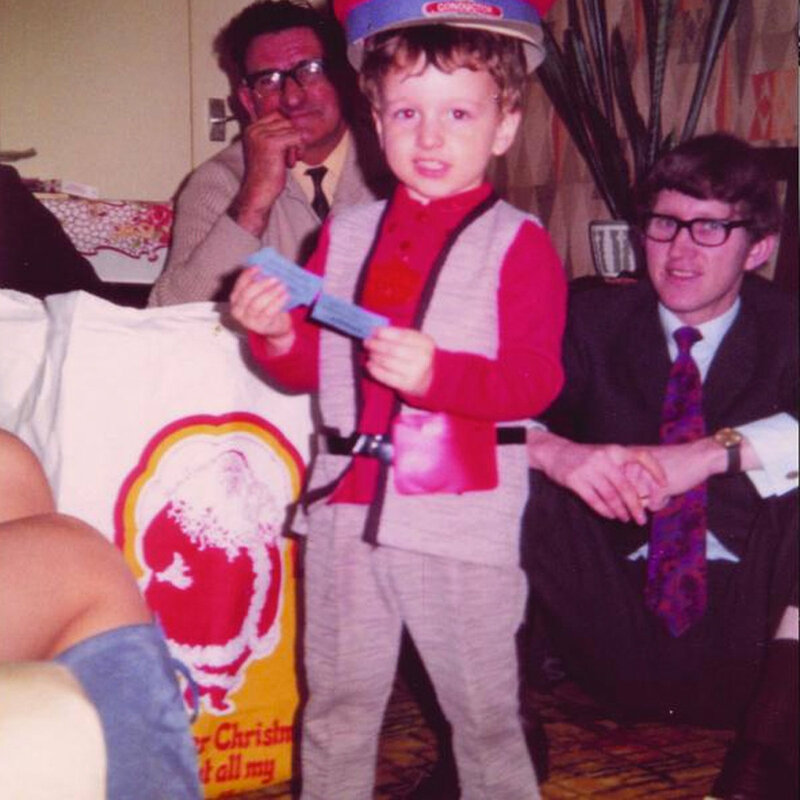 In the end, I did not contact the band, and I have to say I was very pleased to find out they released a Christmas single after all. And not only that, but they even stuck to the Snowflakes Singles Club format – without knowing it probably – with an original Christmas song on the A-side of their single and a cover on the B-side. The single was released on December 8 by their label Moshi Moshi Records, one of the most active and, if you ask me, best UK indie labels, and comes in a funny sleeve, picturing the three girls on the beach, in what looks like the midst of the English Summer (so it's not too sunny), making a little dance with Santa hats on their heads. A litte background about Girl Ray. The band is based in North London, and was formed by schoolfriends singer and guitarist Poppy Hankin and drummer Iris McConnell. After writing songs and trying out all kind of stuff together, without really going anywhere, things really starting rolling after the two where joined by another school friend Sophie Moss on bass. The band, the name cleverly inspied by avantgarde photographer Man Ray, released a first (digital) single 'Ghosty' and followed it up with the above mentioned 'Trouble' and a full length album this year. The Christmas single was in the works for some time, and it seems the title "(I Wish I Were Giving You A Gift) This Christmas" was there before the actual song, because in an interview earlier this year the band already fantasized how great it would be to record a Christmas song with exactly that title. Well, in true DIY fashion (if you want something to be done, do it yourself) they decided to make this great idea happen, and this 45 is the proof of the pudding. According to the press release, '(I Wish I Were Giving You A Gift) This Christmas' is a song about loneliness and longing at Christmas and it ''finds the North London trio embracing a seasonally sonic palette of children's choir, sleigh bells, and the hidden whinny of a kidnapped reindeer'. The press release is complety right here, and this means the song also really sounds like a Christmas song;. Girl Ray is not a band that is all about writing simple catchy melodies. Judging their debut album, the much praised 'Earl Grey' the band has a lot of different ideas, and their songs, although firmly rooted in the UK indie pop tradition, go in all sort of directions. The same is the case of '(I Wish I Were Giving You A Gift) This Christmas'. It's the kind of song that you first have to get used to, with all the tempo changes, different instruments used (piano, sax), but after a few listens, you will start to love it, and can't wait to play it again, because in a way, it keeps sounding fresh. The vocals sound very British, at least to my ears, with adds only to the charm of the song. And just wait till the children's voices join in, singing the main wish the song expresses 'I need a friend tonight'. A melancholic song, yes, but a sad one, no. The B-side has Girl Ray's take on the classic 'I'll Be Home This Christmas'. This song, sung by all the Christmas greats like Bing Crosby (who recorded the original version), Perry Como and Frank Sinatra, was written during World War II, and is another song about longing, longing to be home with your loved ones. 'if only in my dreams'. So both sides seem to have a common theme. Girl Ray plays the song on what sounds like a very old casio. It sounds like it was recorded in a bedroom; what it probably also was. And what better place to record a song about longing to be home, at home? The single is still available in most of the good independent record shops all around the world (Moshi Moshi usually has a good distribution) or directly from the label. The complete single, including the B-side, is also found on the band's Bandcamp. 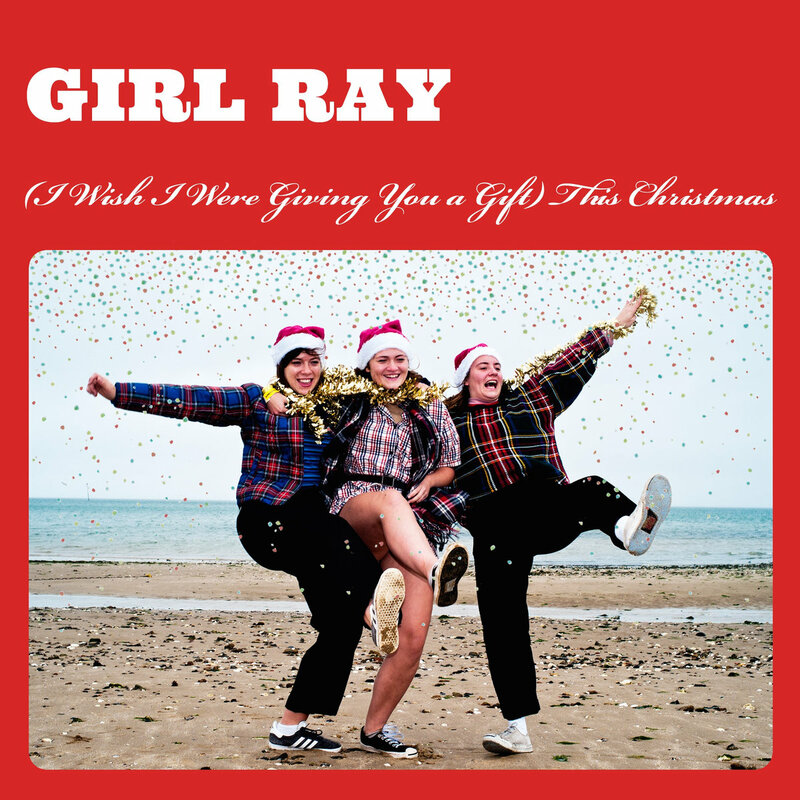 (I Wish I Were Giving You a Gift) This Christmas by Girl Ray . Martha, came to my attention a few years ago, after the band just started out, as they were described as an anarchist vegan straight edge band. For the uninitiated – anarchist means 'no government and no authority', vegan means 'no meat, no diary, no eggs and no other animal products' and straight edge means 'no drugs, no alcohol, no cigarettes and no other intoxicants'. Indeed, that are a lot of 'no's'. Most bands that follow this ideology and lifestyle play music that is sometimes fast, sometimes heavy, but always loud. But not Martha, as their main inspirations are pop punk, indie pop, pop rock and well, pop. So they are a bit of an anomality, and anomalities are always interesting. Especially anomalities that you share a common lifestyle with. As I am also very much a 'no'-person. I checked out some of their music, and it sounded nice, while the bands also had a lot of intelligent things to say, always a pre in my book. Music is important, but the perfect song not only has great melodies, but also lyrics that inspire or touch you. Anyway, I kept following the band from a distance, and it was a happy surprise to find out they released a Christmas single this year. Well, not really a Christmas single, as there is not a single mention of Christmas on neither the A-side or the B-side. But the single comes in a seasonal cover, with a picture that seems to be taken on Christmas Day, probably somewhere in the 1970s, and if you look well, you clearly see a Santa Claus and the word 'Christmas'. The A-side of the single has 'Winter' in the title, and is about the winter, so all in all, it's – just – enough to pass the 'Christmas single'-test. 'The Winter Fuel Allowance Ineligibility Blues' is not a new song, as it was previously released on the compilation 'It Came From Plan-It-X'. But as this compilation is long sold out and label Plan-It-X has ceased operations, so there is enough reason to re-release this song for the winter season on a fresh 7”. And so did Nathan Stephens-Griffin, Naomi Griffin, Daniel Ellis, and JC Cairns, the four that make up the band. It is a truely democratic band, so all band members share lead vocals, JC Cairns doing most vocal duties on 'The Winter Fuel Allowance Ineligibility Blues' – great title, by the way. In essence, the song is a love song. It talks about being faced by poverty and hardship 'being battered by the cruelty of this Tory Government', to put it in the words of the band, with, among many other things, a gas bill that is overdue. But then there is still love. That inspires. And pulls you through. And how do you express how much you love the person that is responsible for all these good things in your life? Very simple. 'You know I love you because the heating is on when you come around'. Yes, you put the heating on, as you don't want that special person to catch a cold. That goes without saying. The song is fastpaced, urgent, catchy, with jangling guitars and even some oeh-oeh-oeh backup vocals. The B-side is a cover of The Marked Men's 'Fix My Brain', and has no connection to Christmas or winter whatsoever. The single is, as Martha puts it on their Bandcamp, pressed on 'weirdo random mixed up vinyl'. I haven't received mine copy yet (it is in the mail), so I can't tell what this exactly means, but I think you get the idea. As a sad side note, this Martha single is the last release for Fortuna POP. Above, I praised Moshi Moshi as one of the finest British indie labels, but the same could be said about Fortuna POP. Unfortunately, the label choose to throw the towel in the ring, after 171 releases. The single is sold out at Martha's bandcamp, but when you go out to buy the Girl Ray single at this fine indie record shop down the road, you can pick up a copy of this single, too. And if you were lucky enough to get a Bis single through the mail last month (or bought it in that same record shop at that time), you can create your own UK indie Christmas on your turntable. If not, you can always listen to the Martha tracks on their Bandcamp.